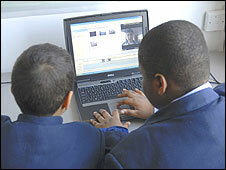 A scheme to give free laptops to pupils from poor backgrounds is being rolled out to 270,000 families in England. The £300m Home Access scheme, first announced by Prime Minister Gordon Brown in 2008, has been piloted in two local areas. It will allow some of the most in need children, those in care and from the poorest homes, to apply for a grant for a free laptop and broadband connection. It aims to help bridge the achievement gap between rich and poor pupils. A recent study from the Institute of Fiscal Studies suggested having a laptop at home could lead to a two grade improvement in one subject at GCSE. But the free laptop scheme has been a long time coming, with the first hint families would be provided with computers coming from Mr Brown when he was Chancellor back in 1999. This first scheme, which formed part of the Home Computing Initiative, involved firms leasing out free computers to their employees in return to tax breaks. It eventually gained the support of about 60 companies but was wound up after seven years. Under this new scheme, which was due to go nationwide last autumn and was championed by former education minister Jim Knight, the family gets the laptop to keep, but the broadband connection is funded for one year. After that they can decide whether to keep funding the connection themselves. Not all children on free school meals, the government's benchmark for poor children, will get computers, a department spokesman said. But families with children aged seven to 14 will be able to apply for a grant to buy a computer and broadband connection from an approved stockist. Children in council care and with specific educational needs will be prioritised. Children's Secretary Ed Balls said: "Families who are most in need cannot be left behind in the digital revolution we're seeing in education. "We're leading the world with the way we use technology in learning and we've shown our commitment to this by making ICT the backbone of every lesson in the new primary curriculum. "Because of this, it's absolutely right that we're investing £300 million so children who need the most support have access to the resources they need at home." He said there were educational, economic and social benefits of being online at home that could not be ignored. Computers were no longer a luxury for the few, but are as essential a part of education as books, pens and paper, he added. The announcement comes as new research involving 200 schools and colleges suggested 80% were seeing cuts to their IT budgets. The poll for the technology solutions provider the Stone Group also suggested just 14% of schools offered out of hours technical support to staff.